It is 1849. Across Europe, the high tide of revolution has crested, leaving recrimination and betrayal in its wake. From the high councils of Prussia to the corridors of Parliament, the powers-that-be breathe sighs of relief. But the powers-that-be are hardly unified among themselves. Far from it . . .
On the south coast of England, London man-about-town James Cobham comes to himself in a country inn, with no idea how he got there. Corresponding with his brother, he discovers he has been presumed drowned in a boating accident. Together they decide that he should stay put for the moment, while they investigate what may have transpired. For James Cobham is a wanted man—wanted by conspiring factions of the government and the Chartists alike, and also targeted by a magical conspiracy inside his own family. And so the adventure of Freedom and Necessity begins… leading the reader through every corner of mid-nineteenth-century Britain, from the parlors of the elite to the dens of the underclass. 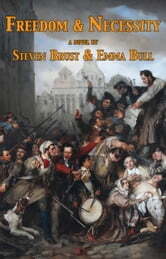 Steven Brust and Emma Bull have crafted a masterful mix of fantasy and historical fiction. Not since Wilkie Collins or Conan Doyle has there been such a profusion of guns, swordfights, family intrigues, women disguised as men, occult societies, philosophical discussions, and, of course, passionate romance.